It's expensive and often doesn't provide a satisfactory result!) . 5. )A sharp scissors for precise clipping and trimming (a small nail scissors is recommended). * Note: when a damaged garment is a bit shrunken and faded, patch it using similarly shrunken and faded material, if possible, that comes from another part of the same garment. This helps hide the mend by providing a durable patch that is almost invisible. 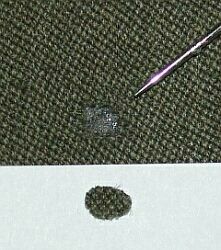 First, secure the hole against fraying. 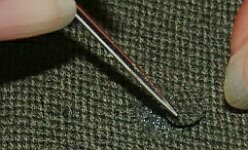 Apply a small amount of cloth glue around the hole from the reverse side (yes, you have to get access to the back of the moth hole by opening some seams if necessary). Iron a small piece of iron-on stabilizer behind the moth hole (shape the inset patch by tearing the border to get a smooth effect that avoids a visible edge when ironing the final result from the front side). If you don't use a stabilizer in the back, the inset patch won't get enough hold to be secure.
. 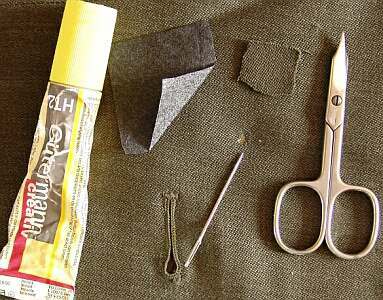 Obtain a small piece of matching, or better, original fabric (i.e., in a facing, hem, pocket or a seam allowance and cut a small piece off there). This is your inset patch. Now secure the inset patch against fraying (this can happen when cutting out the small piece for the moth hole) by first covering the back side with some glue. 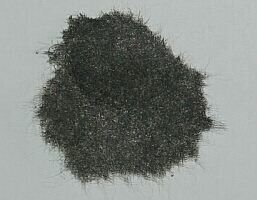 An inset patch that is too small for the purpose will be useless. A little larger (but still tiny) shape is better than one that’s too small. You can compress the inset patch a bit when you glue it into the moth hole. 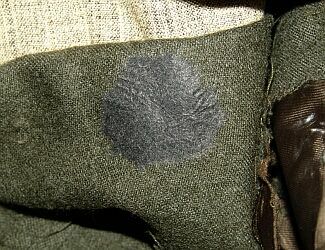 Immediately place the inset patch over the moth hole. Pay careful attention to the weave of the fabric being mended! 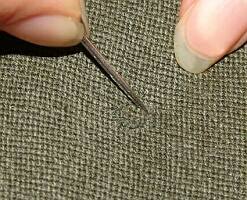 Using a needle, adjust the inset patch to match the directional weave of the fabric and the shape of the hole. If the patch fits, press on. Use a needle to adjust the borders until it looks good. Remember that careful matching helps disguise a patch. Iron the area again to melt the glue with the fabric for better adhesion (special adhesive for fabrics can be melted again by ironing) and to straighten out irregularities in thickness (always use a damp cloth to avoid making the wool fabric look shiny or burned!). If your iron has settings, be sure to use the iron on the “wool” setting. Good luck with your next moth hole repair! . 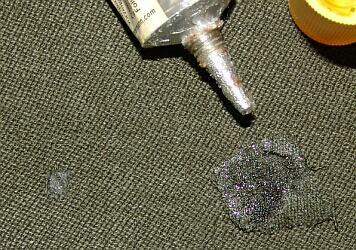 - Special adhesive for fabrics can be removed by cleaning agents or during the washing process. - Please don’t hold me responsible for any damage to your scarce uniform(s) when trying out this procedure! You should practice on discarded fabric or unimportant material and then proceed only when you’re confident of doing a perfect job.